We're now halfway through the candidates. Some of the dinosaurs have really spoken to people, while a couple of the candidates seem to be trailing with less than favorable opinions. Not to accuse the male readers of being sexist, but it was quite clear that our first female candidate last week did not register with men. Though there was some swing with the mother voters, which could play big when the voting finally commences. Tomorrow, once again, a new voice, a new species. Will they speak to you? Will they end up being your candidate; the people's candidate? Make sure to check in tomorrow to find out. Show your support on Facebook and Twitter. Bring in Philosoraptor. His wisdom is beyond repute. 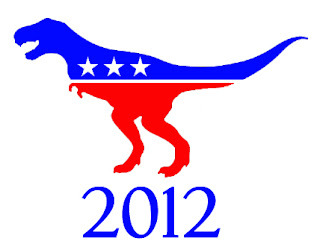 I'm pretty sure whoever your Dino candidate is will be more well received by the public than Romney is. Bring on some more candidates! The men aren't happy with the lady candidate? Blame it on Palin.